Last Sunday, a few of my friends and I decided to go to the popular Winter Wonderland, at Hyde Park. We headed up early to avoid cramped tube conditions and manic queuing! The immediate atmosphere of Winter Wonderland was amazing and was so festive. The many Christmas stalls were amazing, and my friends and I couldn't wait to look at all the lovely products to buy, our favourites being the light up star lamp shades and the decorative dishes. My friend also bought a faux fur headband that she fell in love with. Winter Wonderland was filled with smells of gorgeous festive (and really expensive) treats, including hot chocolates, waffles, chestnuts and doughnuts! 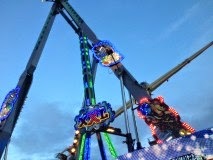 The rides looked fantastic, but were very expensive (about £7-£9 a ride!). A couple of my friends went on the spinner ride called the XXL, and the rest of us watched while taking selfies, and laughing at their swinging legs! 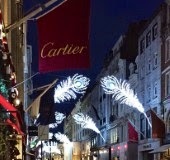 After Winter Wonderland we decided to look at the sparkly lights on Regents Street and Canaby Street! 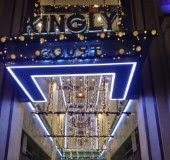 They were amazingly beautiful and very Christmassy. After a long walk we decided to head for something to eat, Wagamamas it was! Overall such a lovely, cute day! If you are put off of going to Winter Wonderland because of the prices, I would urge you to go to soak in the atmosphere, as there is a great atmosphere with great live bands!